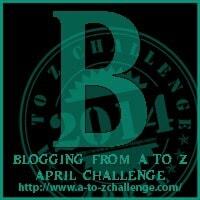 For the month of April I am participating in a Blogging A-Z Challenge. I am supposed to blog a topic with each letter of the alphabet for the entire month, minus Sundays. I am putting a Disney Twist on it and blogging about Disney characters, rides, movies, and attractions that begin with each letter. Some days will be easy some will be more difficult as I try to come up with something for that letter. 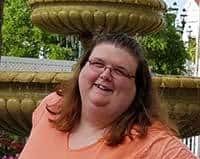 If you are a blogger, come join me in this challenge or check out what other bloggers are blogging about by clicking here. This attraction can be found at the Magic Kingdom in Fantasyland. 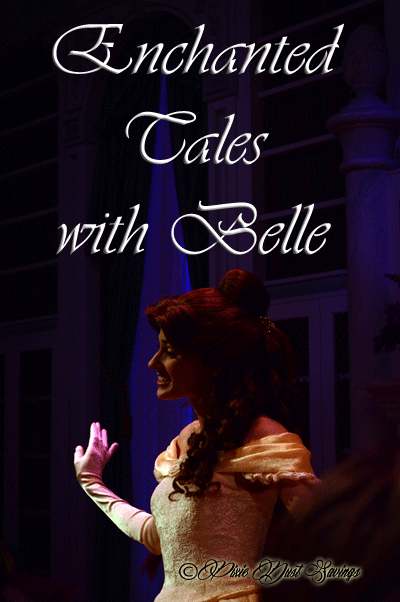 Enchanted Tales with Belle is an interactive meet and greet. 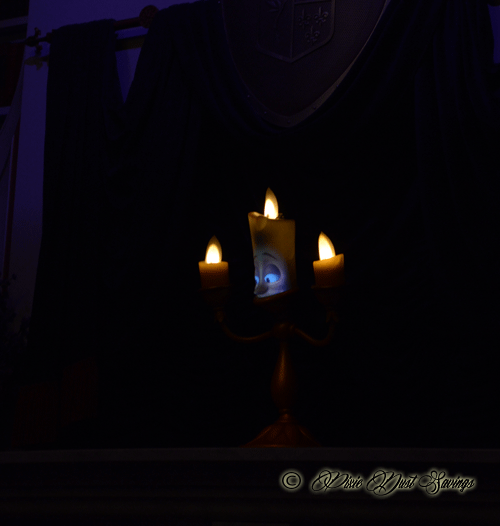 Enchanted Tales with Belle makes the story of Beauty and the Beast come alive in more ways than one. The first place you are taken is to Maurice’s workshop. His tools and plans for inventions are scattered all over the place. A mirror is behind the bench and it is an enchanted mirror. Together you say “take us back to the night Belle fell in love with the Beast”. The mirror magically grows and becomes a pathway into the Beast’s castle. 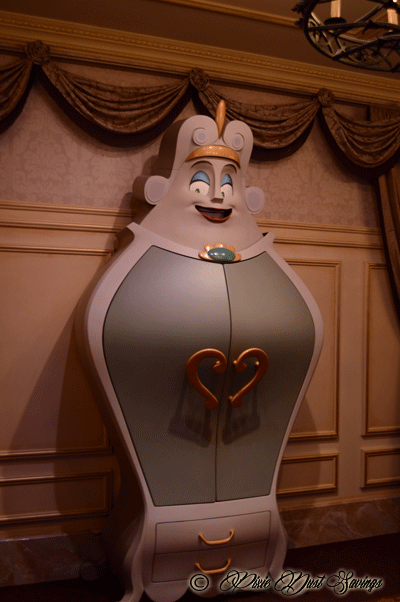 The room you walk into has the wardrobe and she moves. It is really neat to watch. Everyone prepares to help Belle tell the story. Children and some adults are given parts to help re-enact the story. Everyone practices their parts and props are given to those who are participating. After a few minutes of practice we are then invited to the library! Lumière is in the library. He also is animated and is really awesome to watch. Bell then comes out and the story begins. She tells the story and then acts it out with the children. They dance around the room and have lots of fun! At the end of the story she takes pictures with all the participants. I thought it was only for kids so I didn’t get up to take my picture with Belle. I was a little sad as I really wanted a picture with her, but didn’t want to appear silly so I didn’t go up. When the show was over I asked the Photopass photographer if I could of had my picture with Belle and she said absolutely. So, even if you are an adult you can go up in the line get a bookmark and have your picture with Belle. If you are coming to this attraction during a busy time, I would get a Fastpass if this is important to you. Though you do get a picture with Belle, you do not get an autograph. In all honesty, if you don’t care about a picture with Belle and you don’t have kids, I would skip this attraction if you are short on time. It is nice and I will probably do it again just to get the picture, but after that time won’t do it again unless I have kids with me. We have yet to see the new Belle attraction at WDW. Waiting for the lines to die down. I think next time we go we’ll have to make sure to see it. Love the idea for this challenge, and your take on it with Disney! That looks like such a great attraction. My daughter would love to meet Belle. My Kids Would Love This Thank For Sharing We Will Have To Check It Out!! So cool! This must be new! I didnt see it when we were there about a year ago! I haven’t seen this yet – we will be there in a few weeks! I’m so jealous, I want to take our kids here so bad! It looks like there’s a lot of new activities to enjoy. I haven’t done any of the meet and greets at Disney yet. Every time I’ve gone, I either didn’t have a kid yet, or my son was too young to care. Maybe in a couple of years we’ll start meeting the characters. I think he WILL like it eventually! This is great, we loved it too! That looks super fun… my niece would enjoy the heck out of it. She’s a big disney princess fan. Anything Disney, we absolutely love. So fun!